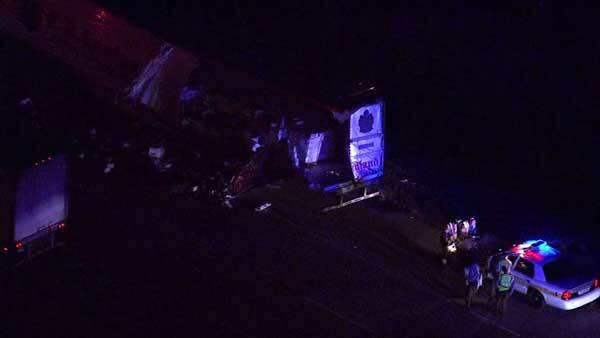 MINOOKA, Ill. (WLS) -- Eastbound I-80 is blocked before the Minooka exit due to a rollover crash involving two semis. Traffic is inching by on the left shoulder. The two semis collided around 5:30 a.m. Tuesday. One truck overturned and landed perpendicular to traffic. The other truck was ripped open, spilling frozen food products onto the road. There were no reports of injuries. Cleanup is underway. There is a two-mile backup on eastbound I-80.